What is a Wonder Wicket Light? A Wonder Wicket Light is a rocket scientist-engineered device that attaches to a croquet wicket and lights the way to croquet in the night. 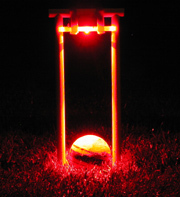 In use, a Wonder Wicket Light illuminates the wicket with a red light that provides a focused spot for shooting directly under the wicket, and a more diffuse light to the immediate surrounding area. 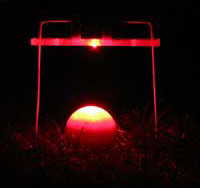 In addition, a Wonder Wicket Light provides a bar of light across the wicket to indicate wicket orientation. When and where could I use Wonder Wicket Lights? These devices were designed for low ambient lighting situations. For instance a backyard party with decorative lighting such as yard torches, strings of colored party lights, decorative shrubbery lighting, etc. This frequently provides "almost" enough illumination for Croquet to be enjoyed. The problem is usually the inability to see the wickets clearly, AND to determine if a ball has passed through a Wicket. This is where the WWL's shine, and you would benefit greatly from them! We have discovered night Croquet (we call it Gloquet) to be an exciting, enjoyable and interesting variation on the game. The lights also look attractive in the yard and provide great party ambiance! 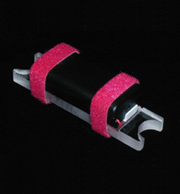 Each Wonder Wicket Light consists of a light transmissible bar, an impact resistant red LED, a battery pack, and straps to securely fasten the unit to the wicket. When turned on, the LED glows from within the light transmissible bar, to indicate wicket orientation and provide the circles of concentric light. Click the image below to see a video clip of a ball in the dark rolling through a wicket under the Wonder Wicket Light. (Flash player required. Download free Flash player here). 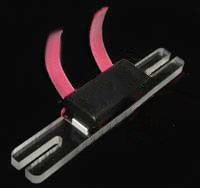 Wonder Wicket Lights were designed to be sleek and rugged, and without delicate or intrusive parts.